Foggy morning outside this morning. We’ve recently been moving things about ‘chez-nous’ in the endlessly on-going restoration work on our old, leaky house. bucketing it in through th estudio roof. About three insches floding teh other day. And so had to pull out from the spider’s lair under a double bed, a few beaten up , dusty portfolios…. The little that remains from the numerous shake-downs, great bonfires, binning sessions, house-moves, changes of studio, changes of direction, self-estimation, doubts, always the doubts, the reaffirmations of faith, the poverty, & , yes, even the occassional sales. The above was one of my first ‘wet on wet’. why bother blog it? Don’t know really. it’s not very good. I mean I’ve seen a lot students do better than I first time round, their first go. Wet on Wet always solicites great surprises when the beginner is unfamiliar with the sensation of water spreading out on the paper & the colours actually fusing before one’s very eyes, as if by magic. It is a wonderful feeling. 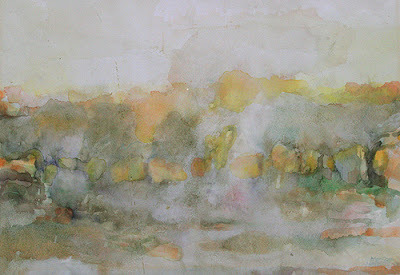 The old watercolour recipe of coloured air, of light & water & fog mixing together. Something of the spontaneous, of the moment. Plein-air, of course. In Hampshire, on home ground. Click on image to enlarge (& see without the blur). This is another watercolour from my beginnings at art school at The University of Newcastle Upon Tyne (1982-1987). 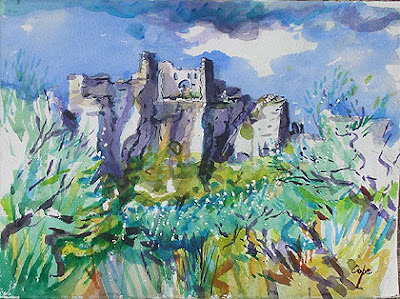 Though I received no formal training as a watercolourist, nothing as structured & well-presented as I try to teach on my painting holidays in france , I was very lucky to have learnt from Norman Adams, the ex Keeper of the Royal Academy School. In no sense was the education formal, but I found his presence inspirational (even if it was something to rebel against). 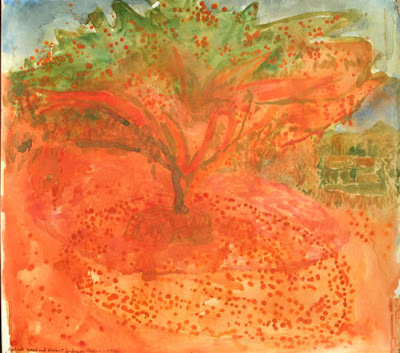 He was an elder artist, in the last & in his case spectular flowering of his creativity, whose work I admired ( & still do). Norman believed that art was a matter of vision (& not technique). He was very much in the English tradition of Neo-Romantic painters, whose lineage can be traced back to William Blake. ‘A Sense of Place’, where The Image comes not uniquely from work ‘en plein-air’ but from an appreciation of the meaning of the place. Vision, if you like. Poetry & not too many details. Norman was into angels & sunflowers & above all, colour. He also took holidays in the south of France, walked with Vincent at St Rémy & like many northerners, marvelled at the heat & light of the south. During the same period, I used to pass summer holidays in my mother’s house in the Lot. 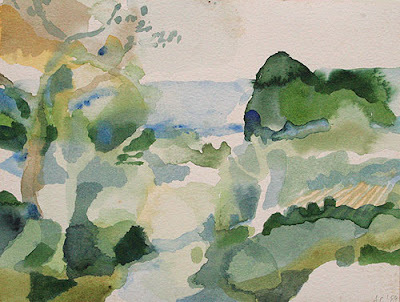 Responding to a new landscape & discovering a new medium, watercolour. I still love both watercolour & landscape very much. Thanks Norman. Thanks Vincent. Thanks William.